Chaang Thai offers diners a cozy, relaxed atmosphere. The staff at Chaang Thai, where superior customer service is a priority. 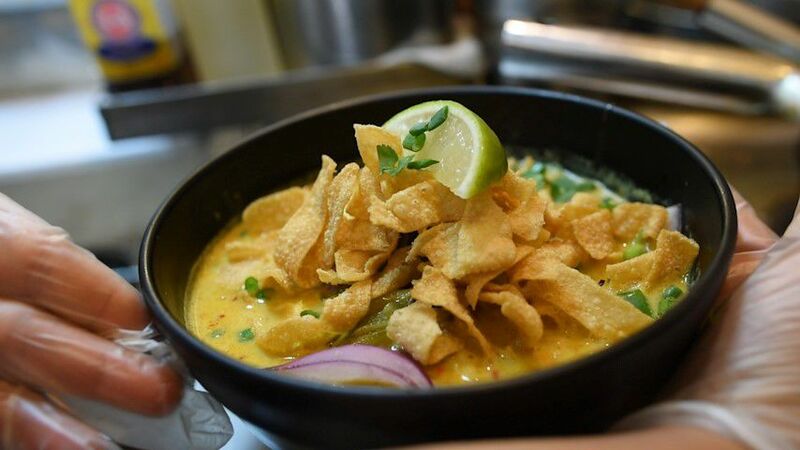 With Chaang Thai approaching their fifth anniversary this month, owner Suwanna Sumnieng-Meyer took some time to reflect on what initially inspired her to open the restaurant, and her continuing dedication to innovating what they offer. “I have a passion about cooking, and that’s what inspired me to open Chaang Thai. To cook authentic Thai food for people who live in Colorado Springs and areas close by,” she said. Although Suwanna did not have any professional culinary experience prior to opening the restaurant, she learned to cook with her parents and grandmother while growing up near Bangkok, and it remained a hobby thereafter. It was this enthusiasm for cooking that led her to open Chaang Thai when she moved here in 2014 to pursue a master’s degree. Fresh ingredients have always been at the cornerstone of Meyer’s vision for the restaurant. Said Suwanna, “We use no frozen vegetables at all.” For each dish, the sauces are prepared on the spot for optimal freshness, translating to a superior dining experience. And that theme of freshness extends to the restaurant’s menus and schedule of events, which are also routinely refreshed to keep things interesting. As far as the atmosphere goes, Suwanna has achieved a cozy, relaxed vibe, with midcentury jazz music playing in the background, and a decorating scheme that nicely combines elements of modern industrial styling with antique hand-drawn artworks that Suwanna brought from Thailand. Another big focus is on the presentation of the food, with thoughtful garnishes that create colorful culinary works of art. She uses family recipes, as her methods for preparing Chaang Thai’s curries and Pad Thai noodles were taught to Suwanna by her mother, who also came here temporarily to help open the restaurant. Through Meyer’s ongoing research into cooking, she’s made her own improvements to the recipes since, and is always trying to find new and creative approaches to preparation and presentation. She said that their Pad Thai noodles and curries remain some of the most popular items on the menu. “Everything here, mostly the taste is close to Thailand, in the center of Bangkok. 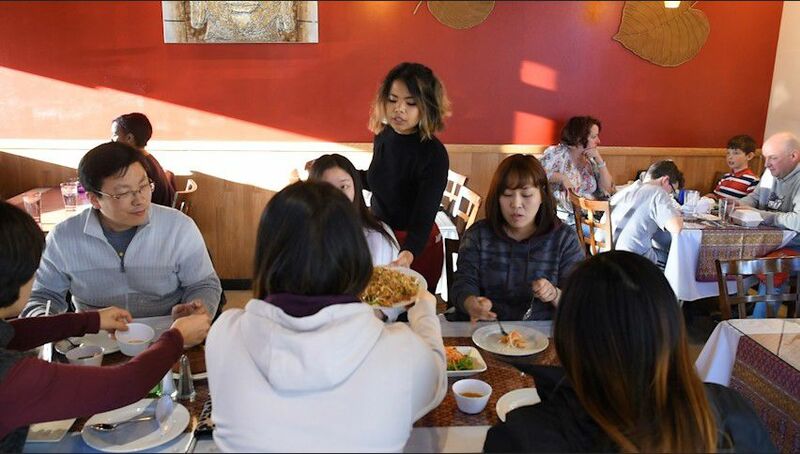 Most customers love to order Pad Thai Noodles, and every curry here tastes so delicious, they love it,” she said. The freshness of the ingredients used in their Panang Curry with beef dish served during our visit was immediately evident; the carrots, snow peas and green beans all snapped with appropriate firmness. All the spices were boldly present at the precise medium-heat level requested, yet perfectly balanced by coconut milk sweetness. The savory slices of beef were perfectly tender, and a side of sticky rice helped to soak up the generous portion of rich curry sauce. Despite the popularity of everyday menu items, Suwanna also creates seasonal menus to keep things interesting for her regular diners, and to set Chaang Thai apart from other local restaurants. In fact, dishes she’s introduced in recent months — like Red Curry with Duck, and Crispy Pork Belly — have emerged as new favorites. A dish exclusive to Chaang Thai, The Crispy Pork Belly they served us was truly excellent — thinly sliced, breaded and fried to a perfect crispness/tenderness ratio, appealingly plated atop a banana-leaf, sprinkled with scallions and nicely complemented by an accompanying Roasted Lime Chili Sauce that added a light, piquant tanginess. It’s easy to understand why this has been a top seller. The restaurant has also become popular among gluten-free and vegan diners because of the dietary considerations they receive. Rather than just listing those items within the everyday menu, Meyer has created two full separate menus so these customers are specifically catered to. Each menu closely mirrors the everyday menu, only substituting whatever aspects necessary to align with those diets. Suwanna and her staff are also vigilant about making separate sauces to cater to those dietary needs, and to clean the cooking equipment before preparing the meals. “For preparation, if they say ‘gluten-free,’ for the sauce, I make sure we clean the wok so there’s no contamination. And if they say ‘vegan,’ my kitchen knows right away, no animal products,” she said. Another way the restaurant keeps things interesting is by hosting special events. For example, a live cooking demonstration they held last October drew a great response; Suwanna estimates about 40 patrons purchased tickets. “The reason I had that event was because I was thinking that I would like to get closer to my customers, and I would like for my customers to try something different from the menu. And I believe that every year from now on, that event will be getting bigger and bigger because my customers have come back and told me that they loved it very much,” she said. Chaang Thai also takes part in community-minded events like last August’s ‘Vittles for Vests,’ ticket sales from which raised funds to buy bulletproof vests for police officers. “I care about police officers, and when the police department asked me to join this event, I said ‘yes’ right away. We cook food, and people buy a ticket to attend the event. We love and care about police officers very much, and I’m very happy to attend the event to support our community and the police department,” she said. Suwanna is also excited to announce that they have recently received their liquor license, and as of this writing they are now serving alcoholic beverages at the restaurant. Not only will this satisfy the customers who enjoy a drink with dinner, but she also envisions it will add to the appeal of their inviting patio area during warmer months. Chaang Thai is located at 7525 N. Academy Boulevard, for more information and to see their menus, visit chaangthaicos.com.